Saturday afternoons are for musing about history, symbols, semantics, and space, right? 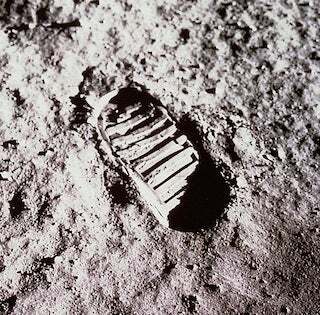 It seemed oddly fitting that Blaze was posting about English grammar at the same time I was pondering the symbolic naming of one of the most iconic images from the the Apollo 11 moon landings. Scientifically, this is undeniably a boot print. Yet it's universally labeled as a more poetic footprint, even in the no-nonsense NASA archives. Why?